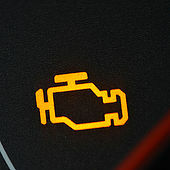 The check engine light is one of the most frustrating and confusing facets of owning a vehicle. It provides no information about the problem and it could be as simple as a loose gas cap, or as serious as the faulty catalytic converter. The basic rule of thumb is: if it's yellow, you can continue to drive, but bring your car in at your earliest convenience. If it's red, pull over to a safe spot, turn off your engine and give us a call. We treat your car’s check engine light with the same thorough approach that our expert ASE-certified technicians take for all our services and repairs. If the light is on and you want a detailed, honest assessment of the health of your car, we stand ready to serve you.